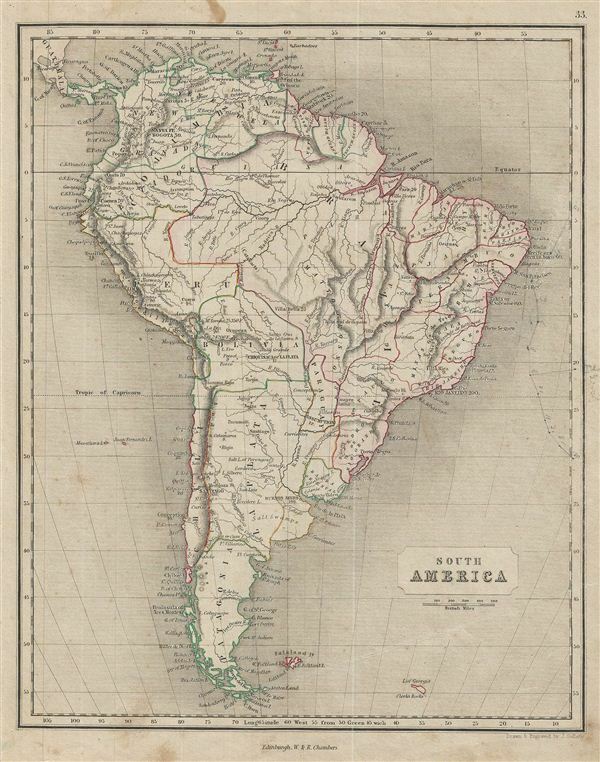 This is a fine example of the 1845 Chambers map of South America. It covers the entire continent from the Caribbean Sea to Tierra del Fuego and from the Pacific to the Atlantic Ocean including the Falkland Islands. Depicts the continent in impressive detail – especially the interior, which at the time was largely unknown. Much of South America was, at this time, embroiled in or about to become embroiled in, severe civil strife. The new nations, freed from Spanish dominance though various wars of liberation in the previous decades, were struggling with their newfound independence in an attempt create stable and prosperous governments. Most dissolved into civil war between 1858 and 1864. Very good. Moderate age toning. Blank on verso. Minor stains on margins. Right margin contains erased pencil marks.